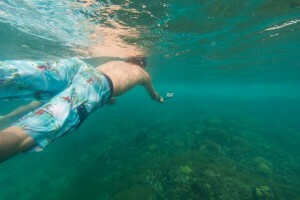 *It is not uncommon for some of the islands inhabitants to ask for a small fee if you want to take their photograph. This generally applies to women wearing traditional clothing however you should ask permission before taking any photos of any individuals. The San Blas day tour begins with transportation from Panama City to Carti in one of the Guna operated, 4×4 shared people carriers. They can take up to 7 passengers and can be a squeeze at times. 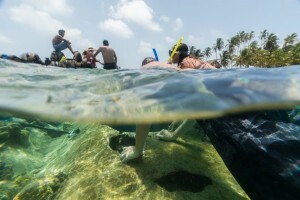 This is the only transport available into the San Blas for a San Blas day tour. The pick up in Panama City is between 5.00am and 5.30am. 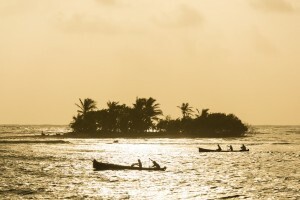 The journey to Carti on the San Blas island mainland is around 2-3 hours through Panama’s spectacular jungle highland. In Carti you will be collected by one of the Guna day tour operators we work with. 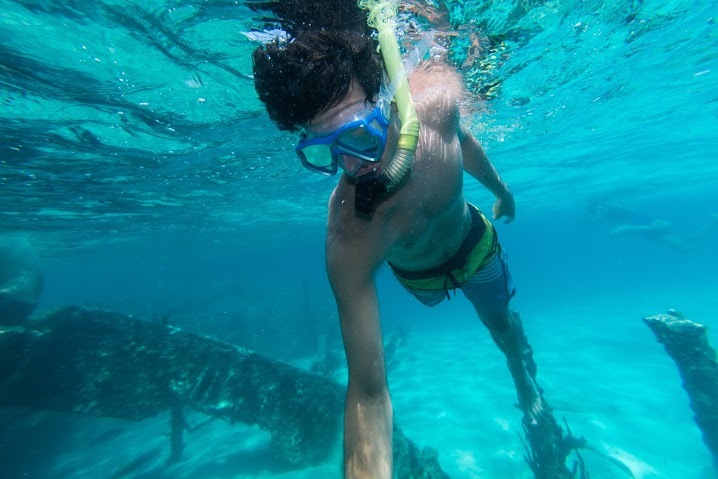 During your San Blas day tour you will normally visit two islands including Isla Perro and the ship wreck where there are ample opportunities to snorkel the wreck and surrounding reefs or just relax in the shallows. 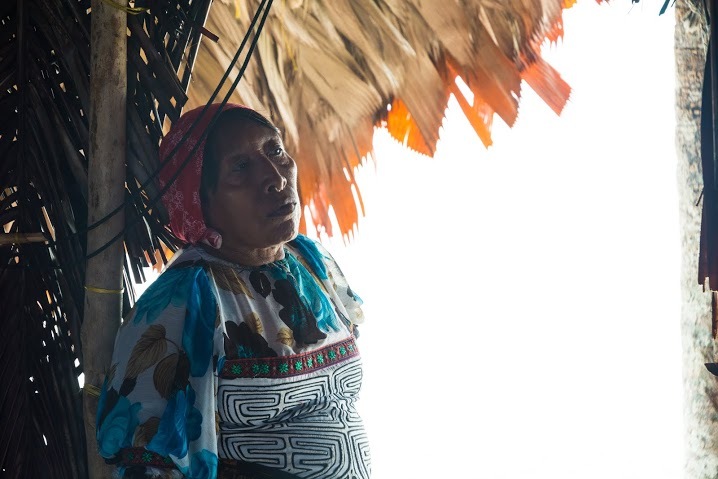 There may be an opportunity to visit one of the Guna Yala communities, these island towns are often dirty and not that pleasant. You would normally get a basic breakfast on arrival, but this has been skipped in the past, we advise you to have a light breakfast before leaving and maybe take a snack, banana, bottle of water with you. You will receive a traditional Guna Yala meal for lunch. The day tours of the islands will finish around 2-3pm, when you will be transported back to Carti on the mainland to meet with the 4×4 transport back to Panama City, you will arrive back in Panama City between 6 and 7pm normally. Be aware that all times given are approximate and the itinerary may vary slightly from the one given. 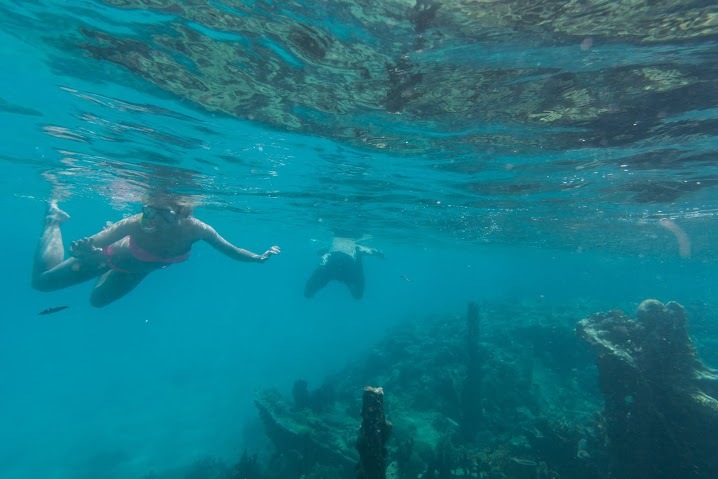 The cost includes 4×4 transport to and from Panama City, Boat tour, Boat man/guide, breakfast (Not always), lunch, community visit (Not always), beach islands, snorkeling. Additional costs are Guna Yala taxes and some San Blas beach taxes $20-24pp (These are payable in cash on route and on Isla Perro). 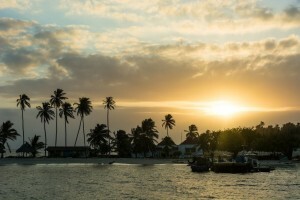 The San Blas islands are one of the few desert island habitats that has not been engulfed by large corporations and the resorts they are affiliated with, as foreign investment is prohibited in the Guna Yala region. With this you need to understand that their service levels might not meet up to what you would expect, they have their own culture and often clients find the lack of interaction and normal guide practices a little hard to deal with. You just need to be aware that they will be courteous and friendly but that is about it. Please take the time to read this fact sheet, it contains important information for any trip to or through the San Blas islands, Panama. In case you didn’t know, San Blas is basically it’s own little country, run by the indigenous Guna Indians. They have their own customs and laws and in many cases Panamanian law doesn’t apply in Guna Yala, as San Blas is also known. 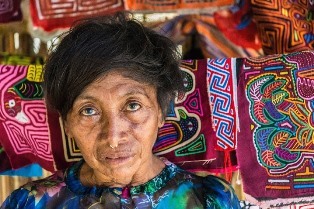 As a native people they have fought hard to maintain their dignity and culture and must be one of the most successful indigenous groups in the world for having done so. Tourism is allowed in San Blas only at their discretion and at times they maintain strict controls over it. It’s very difficult for a non Guna to live within the boundaries of San Blas and practically impossible for a Guna and non Guna to marry and remain in San Blas. It’s also forbidden for outsiders to operate businesses within Guna Yala. The transport is operated on a shared basis and they have to pick up other passengers so will sometimes be late to pick you up and to return you home. They may stop along the way to make stops that are unscheduled, they may try to fit one extra person in the car. The music could be too loud and there could be mechanical problems. 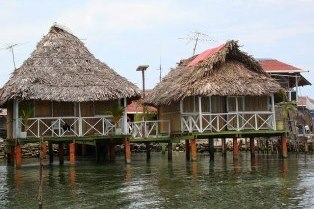 As with any travel agency, we’re making a booking for you in a hotel in San Blas. We don’t operate the hotel nor are we in charge of their reservations. Once we receive a request for a reservation from yourself we will see if the hotel has a vacancy. We will then confirm a reservation for you and ask you for payment. We will ONLY confirm a reservation with you once we have received confirmation from the hotel. 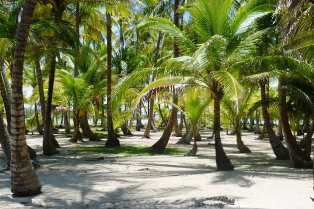 We ask for a payment as the hotels in San Blas usually request full payment before your arrival. We will make those payments on your behalf and obviously reconfirm your booking before your arrival. Now, as anywhere in the world, problems can arise and mistakes can be made. It has been known that a hotel can cancel at short notice, even though a deposit or full payment has been made. This is rare and we try not to work with the hotels that have done this. If this does happen then we will make all efforts to find you a new place to stay and to obtain a refund from the original hotel. As we said, San Blas is certainly not like it is back home and it doesn’t operate like it is. Don’t expect your hotel to be the equivalent of a hotel of equal value in Panama City. Accommodation will be very basic and you may well be sleeping in a grass hut with a sand floor. But I guess that is part of the attraction right? The very fact that you’re not back home and things aren’t the same. If they were, you wouldn’t have come. The food is hit and miss and will often depend on what they are able to catch or buy of local fisherman. Breakfast is often some bread and cheese or a spread like nutella, some of the more upmarket options will include fresh fruit and an egg. Lunch and dinner will normally be rice, plantains, salad, veg, beans, and either fish or chicken. Tomato pasta is also sometimes served and to be frank is not that great. You usually get what you pay for. We try and give an honest idea of what food to expect at each place, but what they tell us may be very different to what they serve up, so we rely on you our clients to tell us if something is not as described so we can either alter the description or try and get them to fulfill what they promise and this goes for everything in the San Blas. There customer service is very different to what you might be used to, some may see it as quirky, others rude but remember you are in their paradise. 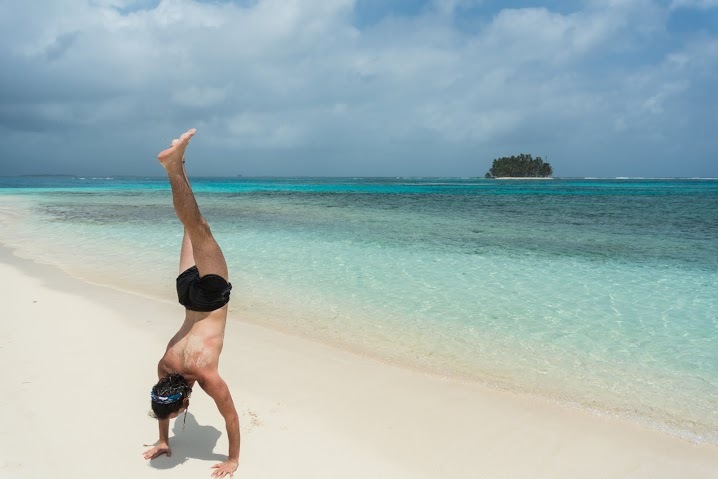 Our 2 or 3 day San Blas island tours give you a combination of enjoying the stunning Lemon Cays island region and remote areas such as the Cayos Holandeses islands. There are a variety of accommodation options on offer in Guna Yala. Cheaper cabanas offer basic facilities while more expensive options offer many more exclusive features.